This script enhances the well-known mIRC IRC client program. 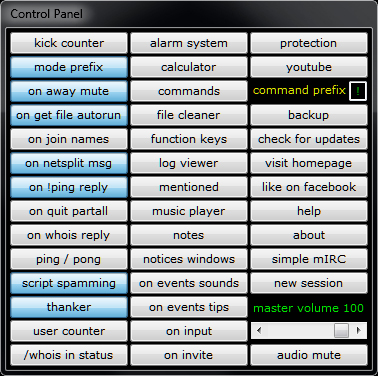 Many features included (Control Panel with a lot of options, Multiple Server/Network Manager with Multiserver Auto-Join, Auto-Identify and Away Systems, Auto Update System, Channel Operator Assist, Alarm System, Music Player, Function keys Manager, Sounds and Tips on every IRC Event, File Cleaner, Log Viewer, BNC/ZNC supporting and much more), using an improved dialog-box based configuration management. DreamIRC script is ready to use after the installation. You will have fun communicating with other IRC users easily and comfortable. The script will be installed as a portable application, which means that you will be able to copy the DreamIRC script's directory to any place on your PC (internal or external Hard Disk Drive, or USB Flash Drive). DreamIRC script version 4.5 build 4 is fully compatible with mIRC version 7.45. It have been tested for a long time on some (Bahamut, Hybrid, InspIRCd, Ircd-ratbox, Ircd-seven, UnrealIRCd) IRC daemons and (Anope, Atheme, Hybrid, Ircd-ratbox, Ircservices) IRC Services software packages. It supports ONLY Microsoft Windows Operating Systems (XP/7/8.1/10). The default language is English, but some features (e.g. jokes, quotes, slaps) are combined in both Greek and English languages. Thanks for your interest about my script. I hope that you will give it a try and finally like it. 2 1 Login to Vote. ©2019 mIRCScripts.net - All Rights Reserved.